We're not sure how much Paddy saw of Athens, as his face was covered up by his hat for half of the adventure. Sorry about that Paddy! We didn't realize it till we saw all the pictures. 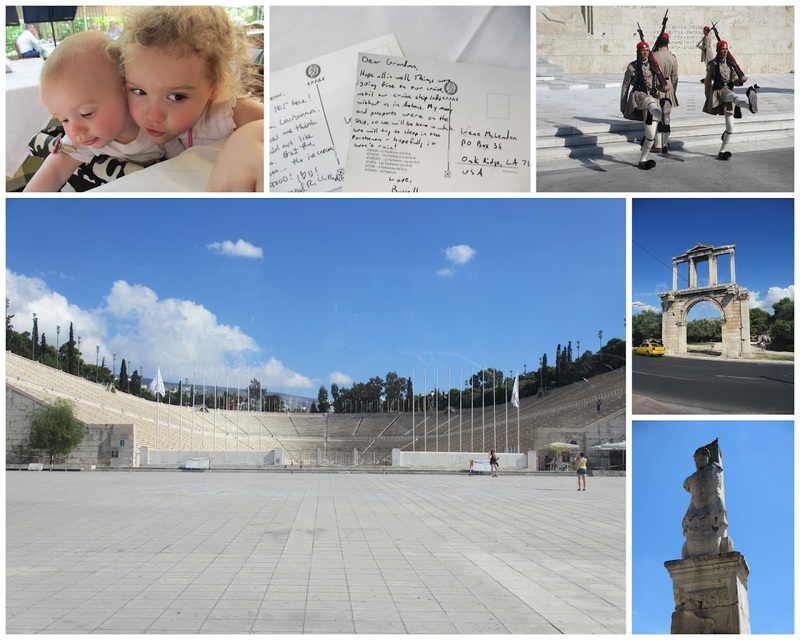 =) For the rest of us, the birthplace of democracy did not disappoint. If y'all are interested in the history, read on. If not, maybe just check out the pictures. 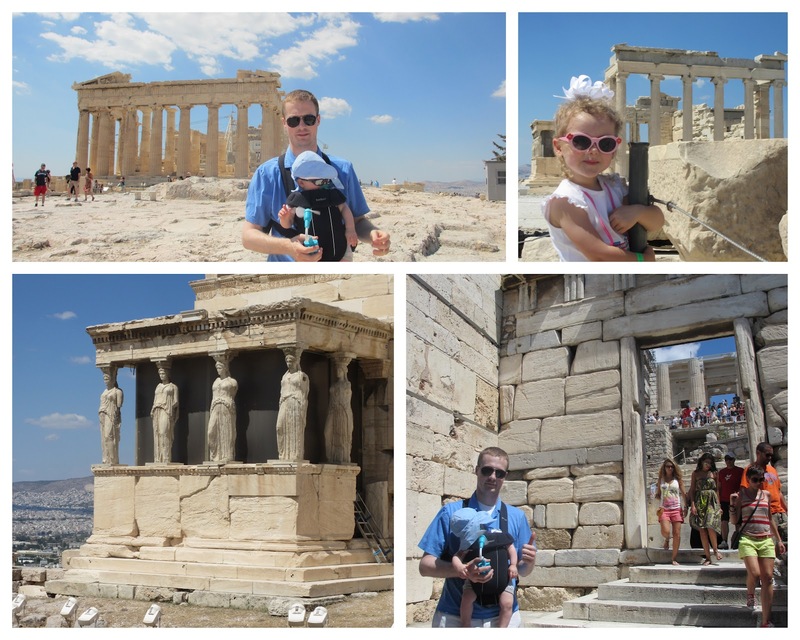 The pics of Paddy/Daddy are in front of the Odeon of Herodes Atticus (the theater) and the Temple of Athena Nike. The other pics are close ups of the columns of the Propylaea (gate to the Parthenon). The columns of the Propylaea and the Parthenon are not single pieces of marble, but stacks of these big chunks called "column drums." When they were stacked, they fit together within 1/1000 of an inch. Pretty solid engineering for the BC period. Here's the Erechteion. It's the often overshadowed temple sharing the Acropolis with the Parthenon. This temple is intended to mark the spot where Athena and Poseiden battled for naming rights of the city. It also stands where the even more ancient Mycenaens had built their palace. Here's Paddy awake (top left) and here's Paddy asleep (bottom right). The walk through history proved too much to handle for the boy. Sweet Claudia really enjoyed herself. 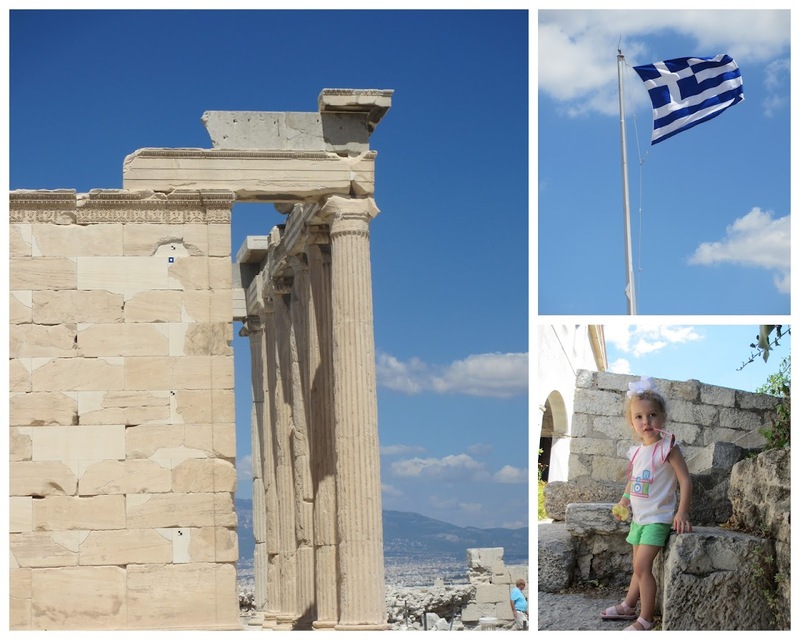 She ascended the Acropolis with no complaints and walked around the whole time, never tiring. Note, I was feeding her gummy bears and marshmallows. This might have had something to do with her remarkable energy and excitement levels. 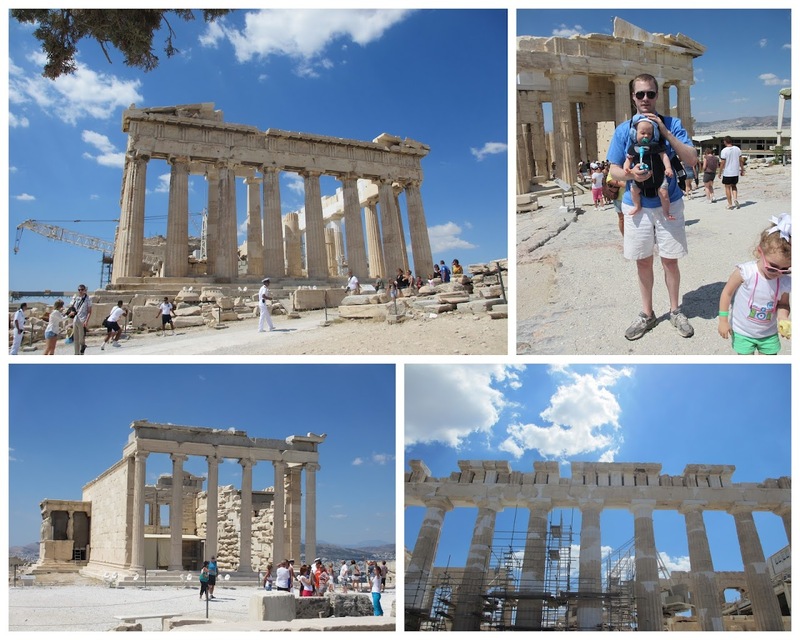 Efforts to restore the Parthenon are ongoing. Did you know that it survived an explosion caused by the Venetians in 1687? The Turks, who were occupying Athens at the time, thought it best to store their armaments and gunpowder in the hallowed temple. When the invading Venetians beseiged the Acropolis, they mortared the Parthenon, successfully wiping out the Turks and a good chunk of the temple. 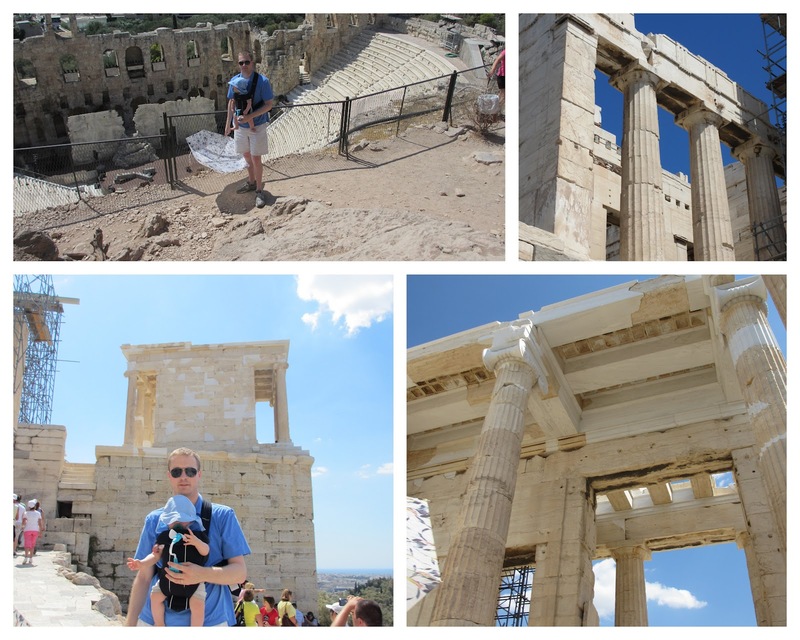 Regardless, the structures of the Acropolis are, in a word, breathtaking. 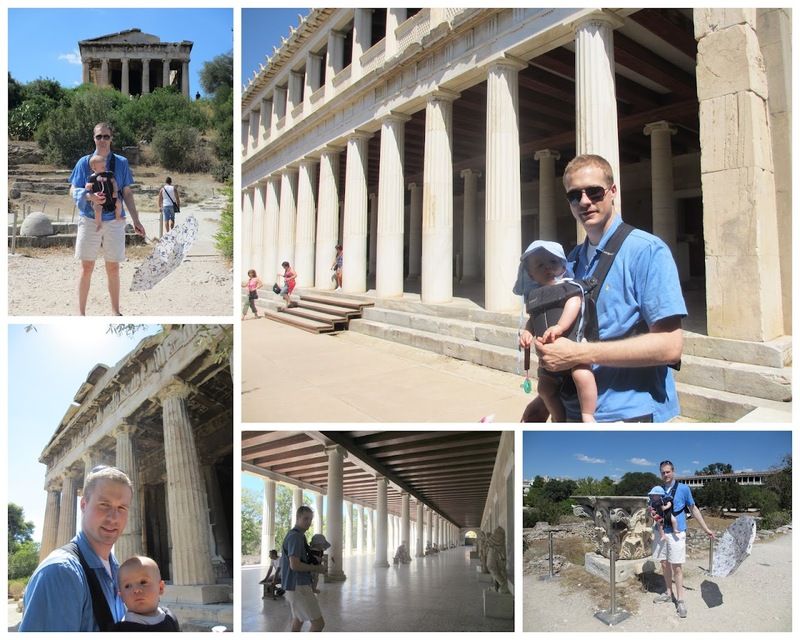 The sights at the Ancient Agora, the "heart of ancient Athens" were equally amazing. We really felt like we were walking through history as we trudged along where the political and social life of ancient Athens thrived. We walked the same paths as Socrates, stood where the city counselors lived and ruled over Athens, and we studied all that has survived the past 2000+ years. Hope all is well. 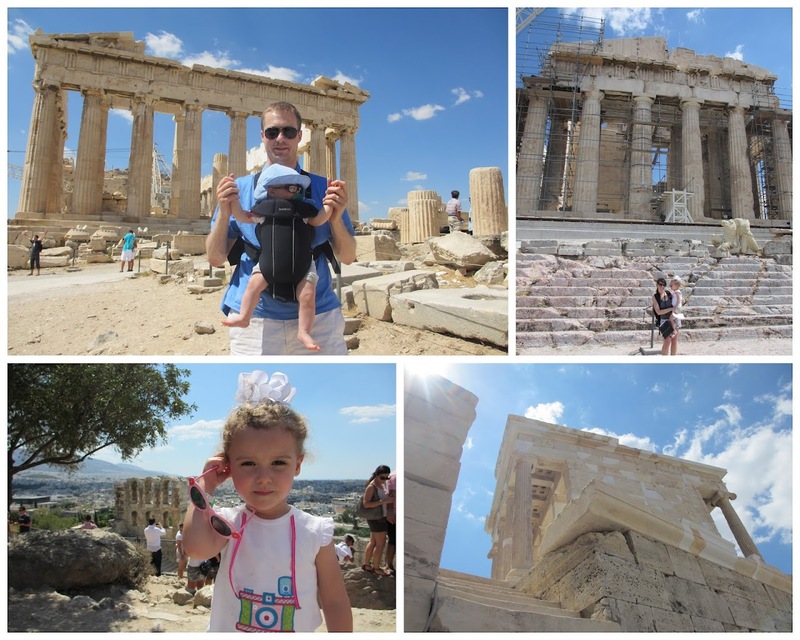 Things were going fine on our cruise, until our cruise ship left without us in Athens. My money and passports were on the ship, so we will be here for a while. We will try to sleep in the Parthenon - hopefully it won't rain! Luckily, we made it on the boat and didn't have to sleep in the Parthenon. Well, three of us didn't sleep in the Parthenon, at least. The grandma postcards are priceless! This looks like such an amazing experience. Beautiful skies & very solid engineering!